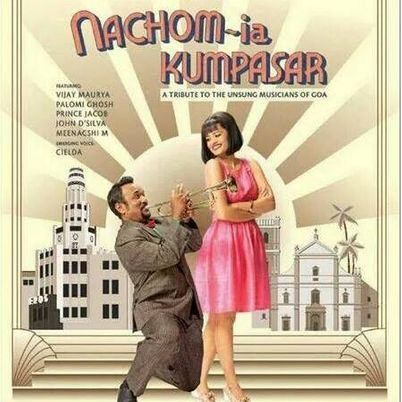 Nachom-ia Kumpasar is one of those films that surprises and delights the senses, especially if you are an aficionado of Goan jazz music and the powerful and scintillating tones of Lorna Cordeiro. Set in the 60s, the film has the authentic air of Goa and Bombay of the bygone era. A Konkani film of this standard is rare and it is no wonder the movie bagged three of the 62nd National Film Awards: for the best feature film in Konkani, best production design, and a special mention. The film is meant to be director Bardroy Barretto’s tribute to the erstwhile musicians of Goa who have had their music integrated with Bollywood melodies and have received little or no acknowledgement of their talent. It was to be a biopic focussing on the lives of Lorna Cordeiro and Chris Perry, until Lorna withdrew her consent for that. With minor alterations, the story follows along the same lines as the biopic might have. The movie finds Lawrence or Lawry trying to gain a foothold in the music scene in Bombay. A brilliant trumpeter and musical genius who is supported by an equally gifted band of musicians, Lawry is told that he lacks something... and that something is a female lead singer. His manager Logic hits upon the idea of going to Goa to find a girl to sing for them. This is where Lawry stumbles upon the nubile Dona singing with gay abandon. Nachom-ai Kumpasar or Let’s Dance to the Rhythm is the first song that is sung at a wedding. Incidentally, this is also the first song that was sung by Lorna Cordeiro. Dona’s mother adamantly refuses to let her daughter go into a profession she considers less than respectable. Eventually the battle is won in Lawry’s favour when musician Chic Chocolate brings Dona’s mother around to permit her daughter to sing for Lawry. With Dona lending her vocals the band hits the jackpot, moving from strength to strength. Things get complicated, however, when the impressionable Dona becomes infatuated with the much older and married Lawry. What follows is a musically interspersed telling of the rollercoaster love affair they have. The movie stars Vijay Maurya as Lawry and Palomi Ghosh as Dona. Vijay Maurya is a theatre and film actor who has acted in critically acclaimed films such as Black Friday and also has an award winning screenplay to his credit. He pulls off the talented and tortured Lawry with aplomb. He has the fewest dialogues among the main actors but is convincing in conveying his emotions just the same. A graduate in Applied Mathematics from the North Carolina State University, USA, Palomi Ghosh is outstanding in her role, effectively portraying an innocent love that goes so wrong. She has even sung two of the songs in the film, Tuzo Mog and Adeus. It was inevitable that this versatile actor be awarded the National Award in the Special Jury Award / Special Mention (Feature Film) category. John D’Silva reprises his comedic persona as Logic and keeps the audience in splits of laughter. The voice of reason in the film is Prince Jacob as the drunkard and freeloader, constantly wheedling alcohol out of the bar’s customers. Other notable actors are Meenacshi Martins, Blasco Andrade, Joseph Fernandes and Roque Lazarus, Natto, Kenny, Samy Braganza, Roy Menezes, Abdonio, Selwyn Braganza, Mathew Araujo, Meena Leitao and Donald Colaco. The songs of the film have a presence of their own. Director Bardroy has selected songs that would, when placed appropriately throughout the film, tell the entire story by themselves. The old world feel of Chris Perry’s music has been maintained by music directors Jackson Pereira and Ronnie Monsorate. Most of the songs have been rendered by Cielda Pereira. Her voice is reminiscent of a younger Lorna – strong and clear. She sings mellifluously to give you a soul stirring experience with the slower numbers and an urge to tap a beat and even stand up and dance to songs with a quicker tempo. Jackson (Cu Cu Ru Cu Cu), V P Mishra (Maria), Ester Noronha (Meu Amor) are the other singers in the movie. Bardroy Barretto, a well-known ad film maker based in Mumbai, met with many hurdles in making this film, primarily in the area of finance. Where big financiers declined aid, Goan NRIs and people who believed in the project funded it. As a director, he delivers a movie that is a pleasurable cinematic experience. He had an excellent team to support him which included Aparna Raina who won the National Award for production design. The movie was produced by Goa Folklore Productions and is still enthralling the Goan audience and making the rounds overseas too. Hopefully this film will alleviate the position of Konkani as a regional language and encourage our Goan youth to cherish their mother tongue. We look forward to more Konkani films of this calibre.